George R. Wilson, 1863-1941. History of Dubois County from its Primitive Days. The Buffalo Trace, now almost obliterated, was such an important factor in settlement, not only of Dubois County, but of other counties in southern Indiana, that it deserves more than passing notice. Why the buffalo is seen upon the seal of Indiana is easily understood when one recalls that buffaloes ranged in countless numbers in Indiana. They made several paths through the state. One passed through Dubois County…. The old Buffalo Trace was so important in pioneer days that William Rector was employed to make a survey of the east end of it, which he did in July, 1805. The old trace from the prairies in Illinois to the blue grass regions of Kentucky crossed the White River at Decker’s ferry north-west of Petersburg, entered Dubois County near the Miley school-house, passed Fort McDonald, went on south of Haysville, thence east, near Ludlow School-house, to Union Valley, and entered Orange County within a hundred yards of the Southern railroad track in Columbia township. It passed near French Lick and Paoli. In Dubois County the trace practically paralleled what is now called Buckingham’s Base Line. Milburn’s Spring, in Columbia Township, and Fort McDonald in Boone Township, were camping grounds along this trace. This old Buffalo Trace is also known as the Mud Holes, Governor’s Trace, Kentucky Road, Louisville Trace, and Vincennes Trace, but the primary cause of the trail was the wild buffalo. Its trail was always near water or wet places. The buffalo wallows along this trace caused it to be called by some, the Mud Hole trace. Today a small branch of Mill Creek bears the name Mud Hole Creek. General Harrison changed the Trace in some places in 1801, and it is sometimes referred to as the Governor’s Trace. On one of his trips over this trace, General Harrison lost his gold watch, was found some years later. In 1801, a traveler along the buffalo trace would have noticed here and there big circular patches, where the grass was greener, thicker, and higher than anywhere else around. Those curious circles of superior grass were due to a cause that will never be seen again. They were the existing reminders of the buffalo days. Those rank and verdant patches of grass marked spots where the once common buffalo wallows were familiar and often welcome landmarks in the forest. Where a little stagnant water had collected, the ground being soft under the short grass, it was an easy matter for the buffalo to make a mud puddle in which to cool himself. To accomplish this, a male buffalo- always a male that made the wallow- would drop on one knee, plunge his horn, and at last his head into the earth, and make an excavation into which the water slowly filtered. Then, throwing himself on his side as flat as he could, he rolled vigorously around, ripping up the ground with his horns and hump, singing himself deeper and deeper and gouging his wallow out larger, until it was dimensions to suit his purpose. 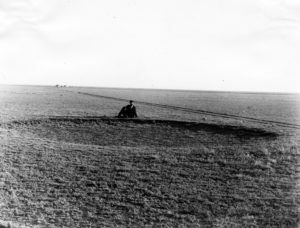 The excavation would gradually fill with water until the buffalo was entirely immersed, the water and mud, mixed to the consistency of mortar, covering him from his head to the tip of his tail. 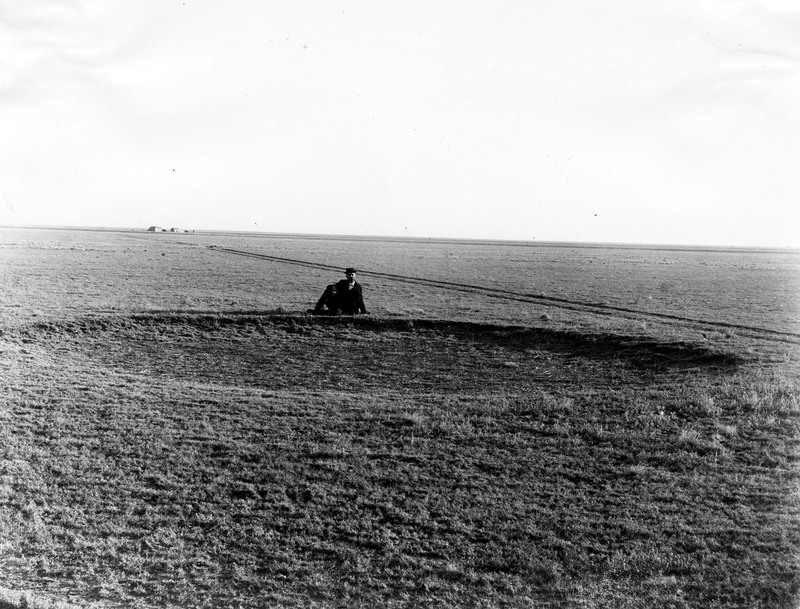 A buffalo wallow was usually about twelve feet in diameter, and from two to three feet deep, and a male buffalo would complete one in half an hour. Sometimes there would be fifty or a hundred waiting for the leader to get through with his bath so they could have a chance at it. He usually took his time wallowing in the mud hole. When it suited him to come out, a frightful looking monster, dripping thick with ooze from his huge body, the male that had won the right to be next in rank entered the wallow for his bath. Over the “Buffalo Trace”, through Dubois County, many thousands of buffalo passed annually. They crossed the Ohio River at the Falls. From the Ohio River to “big Bone Lick,” and the “Blue Licks,” in Kentucky, these animals had beaten a path wide enough for a wagon road. In Dubois County the buffalo’s presence was only transient. He was seen going or coming, and then not later than 1808. Toward the close of the 18th century a very cold winter, continuing several months froze all vegetable growth starved the noble animals, and the herds never regained their loss. Their path made it easier for pioneers to travel in the forests, and accounts for the settlements in this county first appearing in the northern part. Notice that the first white man’s path into the county, on foot, was not paralleled by rail until more than one hundred years had passed. The Buffalo Trace was trodden from time almost immemorial. In turn the buffalo, the Indians, “le coureur de bois” priests, French salt hunters, pioneers, soldiers, settlers, governors, and mail carriers trod its weary way. Over this Trace the government mails, in Dubois County were first carried. The first mail over it was carried on foot, by Mathias Mounts. George Teverbough, a noted pioneer hunter, also carried mail on foot over this trace once a week. One week he traveled from Louisville to Vincennes and reversed his steps the next week. Lieutenants of the “Shawnee Prophet” trod the Buffalo Trace before 1811, inciting the Piankishaw Indians against the whites. Pike County, as well as Dubois County, was first settled along this Trace. Pike County at White Oak Springs and Dubois County at Sherritt’s graveyard. Hosea Smith was a prominent pioneer along this Trace. He was born in North Carolina, and came to Pike County as a pioneer and laid out a town at “White Oak Springs.” Here in 1811, he was postmaster. 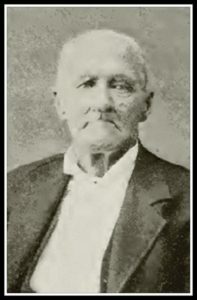 Hosea Smith was county surveyor of Pike county for 30 years and laid out three county towns, Petersburg, 1817; Portersville, 1818; and Jasper in 1830. He was also a justice of the peace, merchant, and farmer…Near this trace in Pike County, Samuel Pride and Hosea Smith built a fort, in 1787, which protected the white settlers from the Indians, who, at times were troublesome. It is related that once when the garrison at the fort was at the point of abandoning it, Mrs. Hosea Smith saved the life of a child of the Indian chief by preventing the white guards from shooting it. She carried the child into the fort. The next day a treaty of peace was made. The Indiana Gazette, the first newspaper published in Indiana, bearsthe date of July 4, 1804. In 1806, the plant was destroyed. It was located at Vincennes. The owner, Elihu Stout, determined to re-establish his paper and on July 4, 1807, again issued his paper, which he then called The Western Sun. the paper thus founded, with few changes, has had continued existence. It is Democratic in politics. The material for this paper was purchased at Frankfort, Kentucky, and carried over the Buffalo Trace on three pack-horses. Mr. Stout rode one of the horses and on the other two were loaded the type, ink and other fixtures and supplies. For years all the material used in the publication of The Western Sun passed through Dubois County over this old trace. The line of travel is the line of intelligence, and this old trace was certainly a line of intelligence in its day. … The McDonalds came to Dubois County in 1801, and made a settlement at what is now Sherritt’s graveyard. They were soon followed by others and built Fort McDonald, the strongest of all local forts, near the Mud Holes, as a protection against the Piankishaw Indians, for at that date the Indians were the probable owners of the land. All of Dubois County except a triangular piece two-and-one-fourth miles wide at the west end and seven miles long on the south side, in Cass Township, was bought from the Indians, on August 3, 1795, but doubts having arisen as to its correct boundaries.